Everyone Wants "the Best" for Their Kids. Wayne Dyer Shows You How to Get It! People always want the best for their children. And thanks to the two-career families of the past decade, to hard work and generally favorable economic conditions they’ve managed to get it. Children of the late 20th century got an abundance of material possessions. But disillusionment has set in. Experience shows that providing material rewards and generous cash outlays to offspring really isn’t doing them any favor. Their needs – and your future hopes for them – require more. Wayne Dyer decided to help us all and put us back on course. First, he asked several thousand parents, grandparents, educators and help professionals, “What do you really want for your children?” Once analyzed the replies, he knew he could help parents everywhere get the very best for their kids. Today’s parents aren’t overly-concerned with their children being admitted to select colleges, advancing in high-powered careers, acquiring riches, or living “the good life.” Instead, they place high values on health, happiness, and personal integrity for their children. In this program, Dr. Dyer shows you how youngsters can be brought up to have high rather than low self-esteem. He shows you how to help them celebrate their own potential greatness and not fear failure. He helps you spot creativity in your offspring, and shows you how to nurture it. He explains how your children can have peace and love in their hearts, instead of anger and hate. Children raised the Wayne Dyer way feel useful and needed rather than unimportant and bored. They are inner rather than outer-directed. They will experience a stress-free life naturally, without resorting to drugs and pills. If this is what you want for your children or grandchildren… if you want them to enjoy every moment of their lives to the fullest... join forces with Dr. Wayne Dyer to reshape these young lives for the better. In addition to the results of his wide-ranging survey, Dr. Dyer speaks from experience. He has children of his own, all raised the Wayne Dyer way. And he’s counseled thousands of young people, discovering in the process where their parents went wrong. He now knows what it takes – what children need and don’t need. 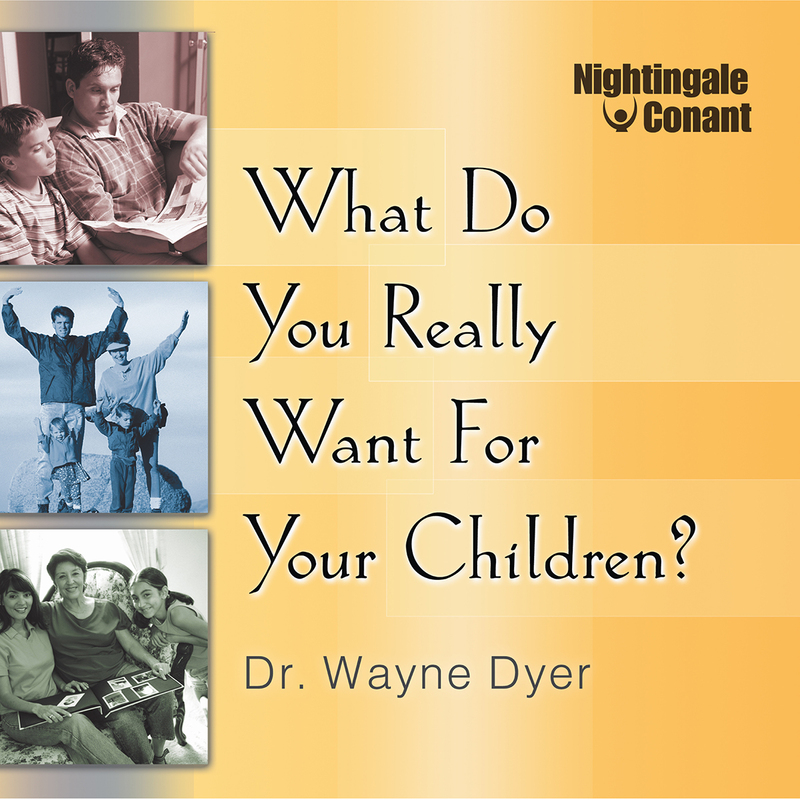 Dr. Dyer believes that to be a good parent, you must help your children become their own parents. He shares with you the approaches that hasten this process. To build into your children the high self-esteem you want them to have. Dr. Dyer suggests going easy on criticism. He shows you how to praise and the proper use of imagery build high-esteem in children. Life consists of a series of risks, to be either taken or shunned. The best-lived lives involve taking many risks, and risk-taking builds confidence. Before your kids can be risk-takers, you must be. Wayne shows you how. Being stress-free, and raising stress-free children is easy, as Wayne shows you on this session. Following his formula, nothing will ever upset you again, unless you let it. This formula is easily transferrable from you to your kids. Successful parenting starts with you setting the example. Since love is our real purpose in life, and since it holds our universe together, you should exhibit love, harmony, and cooperation in every action, and avoid showing anger, hatred and violence. In this session, Wayne tells you why you should neither manipulate your child nor be manipulated by him or her. You discover the definition of success, what disciplining actions are always improper, and why you should want your child to follow his or her inner signals. Children should be raised not to worry about the past, nor to fear the future. This allows them to enjoy and celebrate the present. You learn why children shouldn’t feel guilty about enjoying life. Is it possible to raise children who abhor junk food and focus on being as fit, healthy and positive as possible? Wayne thinks so, and he shares ideas you can use. We all have a talent for innovation. Unfortunately, some of us have been taught to stifle it. Discover how to help your children find and exercise their own creativity. Providing your child with a sense of purpose, a sense of his or her own perfection, and a sense of live is the purpose of this session. Help your child discover how to enjoy both loving him or her self and loving others. Appearing before an audience of parents, Wayne answers their questions on such topics as peer pressure, aimlessness in grown children, undesirable friendships, risk-taking and assertiveness. Loneliness, craving for attention, introversion and extroversion, children who manipulate, tantrums, fights between youngsters, guilt, worry, failure, blind obedience, prejudice and tolerance – all are topics of this final session. According to the news media, Dr. Wayne W Dyer is a author, a psychotherapist, a college professor, a lecturer, a TV and radio personality and a consultant. To his fans everywhere, he is much more that that. Wayne Dyer is a respected and highly regarded analyst of life, and its meaning. Many consider him America’s number one problem solver and life enhancer. I want help to raise great kids. I want to get “the Best” for my kids.